Claude Alfred John Green (1904-2003) led a very productive and useful life. He was voted Duncan’s Citizen of the Year in 1967 in recognition of his services on the Cowichan District Hospital board in planning and building the Cowichan District Hospital. There are two commercial buildings on Kenneth Street in downtown Duncan associated with Claude Green. The first is 161 Kenneth Street, in which Claude Green ran his paint contracting business in the 1930 and 1940s. 161 Kenneth Street has been a restaurant for years but there is still a painted sign, circa 1940, visible on an exterior wall advertising Claude Green’s paint contracting business. In 1949 Claude Green built the building now occupied by Volume One Books at 145-149 Kenneth Street. He intended to use the main floor for his paint contracting business and rent out the four apartments on the second floor. Instead he sold the building to a group of doctors who wanted an investment property. In 1928 Claude Green married Edna Castley and they commissioned architect Douglas James to design and build a new house for them at 733 Wharncliffe Road. This house is still standing. 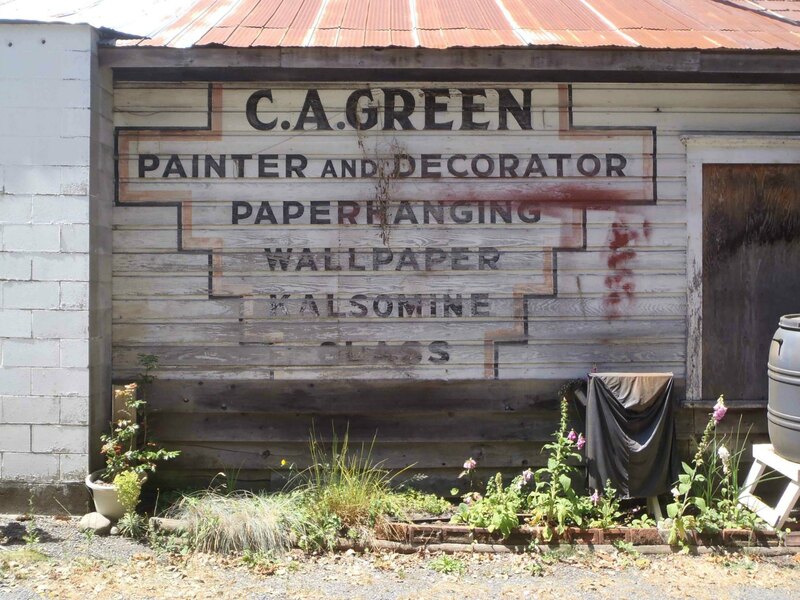 In the 1930s and 1940s, Claude Green ran a paint contracting business, based at 161 Kenneth Street. A painted sign for Claude Green’s painting business is still visible on the exterior wall of 161 Kenneth Street. In 1949 Claude Green built a new two storey building at 145-149 Kenneth Street, which he had designed with commercial space on the main, or grand, floor and four residential apartments on the second floor. He intended to move his paint contracting business into the main floor and rent out the four apartments on the second floor. Instead, Claude Green sold this building to a group of doctors who wanted it as an investment property. 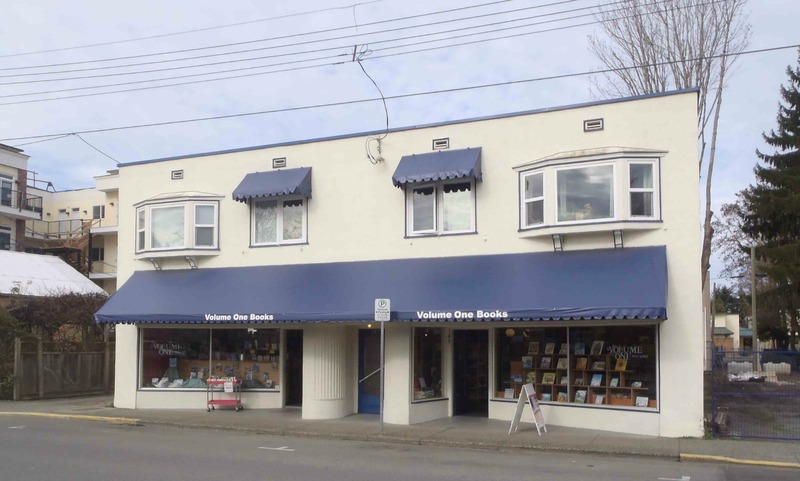 It has been occupied by Volume One Books since 1972. 145-149 Kenneth Street. Built in 1949 by Claude Green. It has been occupied by Volume One Books since 1972. 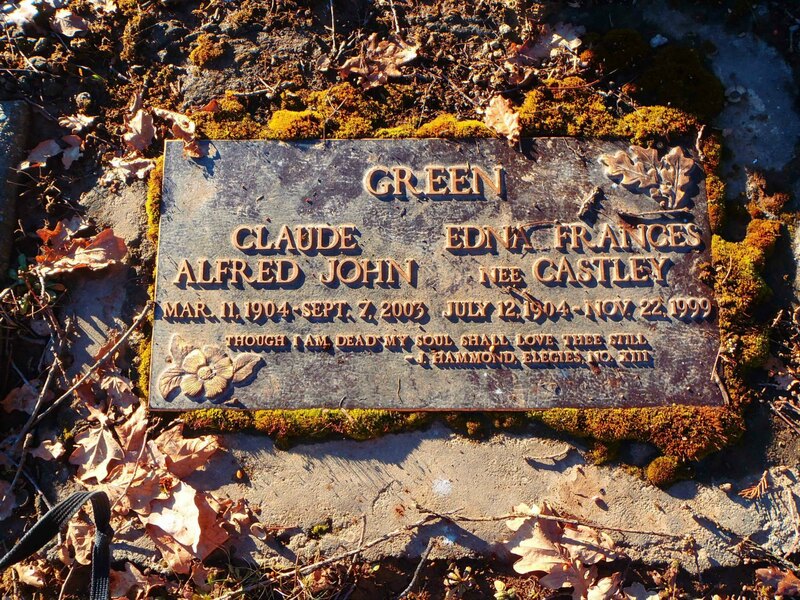 “GREEN – Claude Alfred John, died at Royal Jubilee Hospital, September 7 2003. Claude was born March 11, 1904, in Wealdstone, Middlesex, a northwestern suburb of Folkestone, on the coast of Kent, where he completed his schooling and participated in competitive rowing. In 1921 they emigrated to Canada and settled in Duncan. Claude started a painting and decorating business in 1925, which later evolved into a very successful painting contracting enterprise, primarily utilized by sawmills, pulp mills and logging camps up and down the B.C. coast. After retiring from contracting he became a driving Instructor for the next ten years, an occupation which gave him great enjoyment. 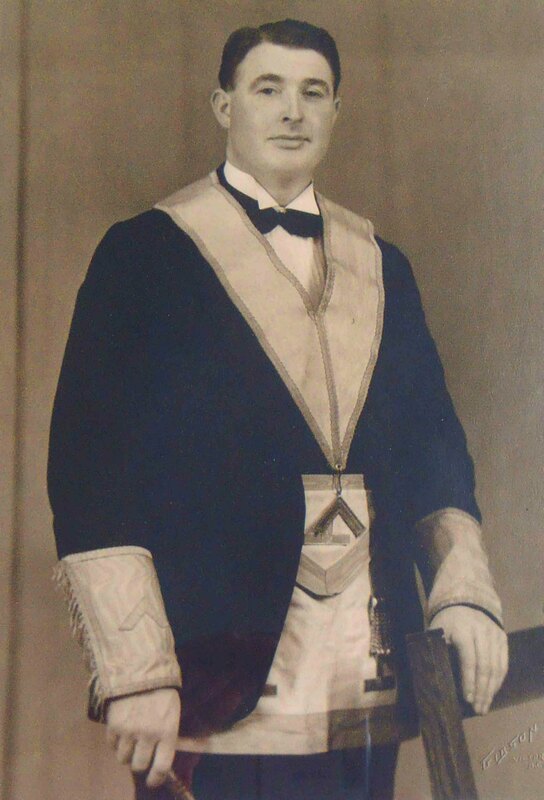 In 1928 he married Edna Castley, a member of one of the pioneering families of the Cowichan Valley, and they built two homes – the first on Wharncliffe Road and, in 1937, a larger one on Grieve Road for their expanding family, a son, Rodney, and a daughter, Sylvia. Edna and Claude were married for 71 happy years. Claude was involved in many facets of local community life, including the Duncan Volunteer Fire Department; the Junior Chamber of Commerce; the Masonic Lodge (becoming Grand Master of British Columbia and Yukon in 1957-58); the Cowichan Cricket Club; the Cowichan Historical Society and Cowichan Valley Museum; Meals on Wheels; and the Cowichan District Hospital Association, of which he was chairman for ten years. During this time he was closely involved in the planning and construction of the Cowichan District Hospital, which opened in September 1967. He was chosen Duncan’s Citizen of the Year in 1967 in recognition of his contributions to the community while serving on the hospital board. Claude was predeceased by his wife, Edna; son, Rodney; daughter-in-law, Jean; grandson, Bruce Green; sister, Edna Swan and brother, Malcolm. He will be greatly missed by daughter, Sylvia (Glenn) Dyer, daughter-in-law Eileen and eight grandchildren, Lyn (Douglas) Bain, Laurie Green (Cyril), Ian (Dinaurea) Cheffins, Lyle (Yvonne) Green, Brian (Joanna) Cheffins, Karen (Jim) Dunn, Christine (Paul) Ringrose and Jonathan Cheffins (Kristianne). He is also survived by six great-granddaughters, six great-grandsons, and nieces and nephews in Canada, England and the United States. The family would like to thank Dr. Stephen Faulkner (Claude’s friend, physician and biographer) for his care and support and the marvelous staff at Wedgwood House, where Claude resided for the last three years, for their assistance and many kindnesses. A wonderful life well lived. In lieu of flowers donations may be made in Claude’s memory to the Duncan District Hospital Foundation, #4-466 Trans-Canada Highway, Duncan, B.C. V9L 3R6 or the Cowichan Valley Museum, Box 1014, Duncan, B.C. V9L 3Y2. A Memorial Service will be held on Saturday, September 20 at the Silver Bridge Inn Travelodge at 2:00 p.m.
Claude and Edna Green are buried in St. Mary’s Somenos Anglican cemetery on Somenos Road, North Cowichan. Would you like to leave a comment or ask a question about Claude Green or anything else on this page?